In New Zealand, the Church of the Flying Spaghetti Monster is an approved religion now. Here’s its first wedding.  In New Zealand, the Church of the Flying Spaghetti Monster is an approved religion now. Here?s its first wedding. You may now canoodle the bride. Fantastisch ! Auf deutsch würde man „Die Braut nudeln“ leicht misverstehen, .. aber das neue Verb „cannoodle“ klasse !